Do you use a word or phrase over and over in your thesis? Perhaps it’s ‘the idea of the New Woman’ or ‘collaborate’ or perhaps even ‘says’. Maybe there’s a subheading where you claim ‘Relecture as an interpretative strategy’, but don’t then explain it; or write something like ‘this is clearly significant’ without saying why. My supervisor used to scrawl ‘UNPACK’ in the margins whenever I did this–and I did this a lot. I can’t find many egregious examples of it from my own thesis as it was printed, he trained me well and caught most of them. But I do often find it in the writing of candidates I work with now, so this is about unpacking, explaining, unfolding your ideas. When we are researching, and writing about our research, two very important things are happening. We are finding out new knowledge. No-one knows this stuff. It’s an original contribution to knowledge because we don’t know it yet. You are the only person in the whole world who has ever been in a position to know this stuff (perhaps because you were the only one to use this method on this data, or because you are the only one to run these particular experiments, or perhaps because no-one has read these texts in the 21st century). Usually this isn’t a straightforward A+B=C kind of discovery. We are discovering bits of it, and it’s quite complicated, and we are wrestling with the knowing and what it means. This leads to the second part of the creation of new knowledge. Because we didn’t know this stuff already, we don’t have a way to talk about it. We may have some vocabulary, and we may be able to describe some aspects of it. But finding a language to describe what you now know, in a way that makes sense to other people who don’t know it yet, is really hard work. Rolled up fractal fiddlehead ferns. See figure 1. How are you not getting this yet? In this blog post, I argue that scholars and candidates in the process of creating and describing new knowledge make use of what I will call ‘fractal terms’–dense meaning packed into a phrase which denotes that new knowledge. Because knowledge is, theoretically, infinite, it is unlikely that any unpacking process will fully lay out this new knowledge. There will be always more to explain, and indeed to discover. This is why the term fractal is used: a ‘A fractal is a natural phenomenon or a mathematical set that exhibits a repeating pattern that displays at every scale. It is also known as expanding symmetry or evolving symmetry’ (Wikipedia). 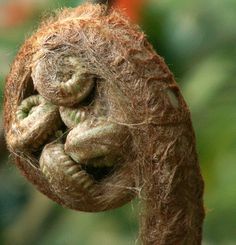 One example used in fractals is the Barnsley Fern (Wikipedia). This leads to the second stage of my metaphor, the fern. These fractal terms are often presented as rolled-up knots of ideas like the rolled-up fern bud, not laid-out like an open fern frond. It is difficult to see what the structure, contents or significance of a rolled up fern might be (see figure 1). Conversely, it is easy, linear, clear and obvious what is involved in an unrolled fern (see figure 2). This makes it difficult for a reader to understand the full meaning and import of this fractal term, leading to comments requesting the writer to ‘explain’ or ‘unpack’ their idea. It is my contention that the reason for writers first presenting their ideas in fractal terms is to do with the difficult process of creating and describing new knowledge. The fractal term ‘stands in’ for a fully developed argument or explanation, while the writer is still coming to understand the new knowledge for themselves. The small phrase or word may contain multitudes of information, in fact they sometimes carry the whole thesis. It may be useful to have a dense, unexplicated, stand-in phrase in the early stages of the research project, as this enables a large bulk of the writing and researching to progress. However, the fractal term must be teased apart, laid out, and expanded in order to properly signpost, argue and elucidate the new information. This means that in later versions of the drafting process, a process of ‘unpacking’ or ‘explicating’ may be required. Ferns. Fractals. See what I mean? Exceptional post! Figure 1 is sooo creepy. Perfect illustration, but creepy.